There are a ton of different factors that go into making the best chef knife. There is also a lot of debate on which knife is the best, but it really comes down to personal preference. What might the best night for someone, might not be the best knife for someone else. Buying the right knife now will make a huge difference down the road. If you buy a quality knife it will surely last you for years. The difference between spending a few extra dollars now is definitely worth it. The difference between a quality knife and a cheap knife is huge. Quality knifes will last you much longer and will be sure to stay sharp for as long as you need. You don’t have to worry about them breaking and bending, simply use them when you need it, and it will be always be there for you ready to perform. We will show you how to find these types of knives and what to look for when buying the best chef knife. If done right, your knife will be a long-term investment and will be sure to last you for years to come. If done wrong, you will probably have to go buy a new one every other week. This is probably one of the biggest factors when choosing your chef knife. There are so many different sizes out there; it can be confusing which one is the best to purchase. What it really comes down to is what you are going to be using it for. The most common sizes are 8,10, and 12 inches. Each size is used for different things. Let’s take a closer look at which size you should be using. The shape of the blade is often commonly overlooked. People see a knife with a big price tag and size they like, but forget to examine the shape of the blade. There are two different shapes, we will get into these more in-depth, but first there are a few things you must know. They are both multipurpose, meaning that they are both able to get the job done. What it really comes down to is personal preference. So, it is recommended you try both before going off and purchasing an expensive knife and not knowing which shape you prefer. Here is a little comparison between the two shapes. These knives are 2 inches wide and usually have the same width throughout. The blade turns into a fine sharp tip on the last 3 inches of the knife. This makes it idea for fine jobs and for using a rocking cutting motion. This is the Japanese version of the French knife. These knives have a flat edge and a curve at the spine instead of a blade. This knife is best suited for straight up and down chopping as compared to the rocking technique commonly used on French knives. The shape of the blade is ultimately personal preference. If you prefer one to another that is the one you should go with. 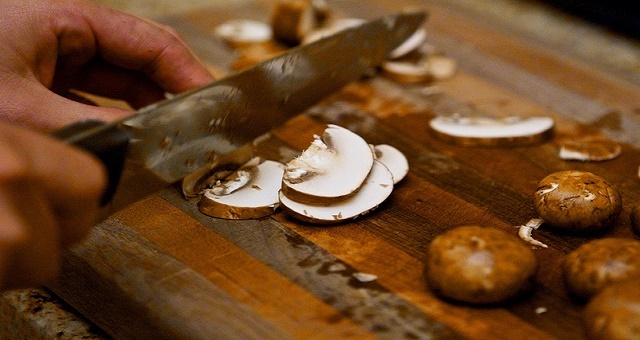 If you plan on doing more up and down chopping, then the Santoku is probably best for you. However, if you plan on doing rocking cutting, then the French knife is your best bet. Often times, one can love the handle and style of a knife so much; they buy the knife solely for that. This is a huge mistake, as the blade itself is so much more important than the other things on a knife. The blade is one of the most vital parts of the best chef knives. Without a good blade, you really have nothing. Having a good blade can make your life so much easier in the kitchen and save you tons of time. There are a few things to look for in a blade, and we will do our best to cover all of them. There are two main types of knife blades. They are stainless steel and ceramic. Stainless steel is the more common of the two. This is due to the fact that is very easy to sharpen, is very durable, and looks great as well. When the blade does get dull, all it takes is a simple sharpener and it is good to go once again. You can even take it into a store and have it done professionally. The other option is ceramic. It is pretty new in the market, but some consumers wear by it. They are all nonreactive; therefore it will not change the taste of your food unlike some other types of knife blades. A big selling point of ceramic knives is that they do not need sharpening and will hold their sharp edge for decades. This is a little bit of false advertising, as after a while it will most likely need some touching up. This is not a big deal however, as it is very easy to sharpen these knives. One must be very careful and delicate with these knives, as dropping them could result in them shattering. But do not worry; this will only happen if it is dropped, as normal use will not cause any problems at all. This is another one of those things that really comes down to personal preference. Both of these types of blades are great. If you prefer not to have to sharpen your knife a lot, then maybe the ceramic is best for you. If you plan on using and abusing your knife, then you should look into a stainless steel due to its durability. Whichever type of knife blade you pick, make sure it is quality. This is one of the most important factors to consider when buying a knife. The right blade will last you years to come and you will never need another knife again. The handle is another one of the huge aspects when choosing a knife. The best chef knives make sure the handles on their knives are only the highest of quality. There are a few different handles to chose from, and this is another one of those personal preference things. The most common handles are wood, resin, plastic, metal, and padded handles. Most of the high quality knives have metal or resin handles. The middle of the road knives generally has wood or resin. And the low quality knives usually have plastic. If you plan on using your knife a lot, you will be most happy with a metal, resin, or wood handle. This is because they fit in the hand the best and fell the most comfortable. The most durable handles however are made out of metal. This is a classic 8-inch knife. It is very cheap, but yet very high quality. It is made of Japanese steel, and always gets the job done. I highly recommend this for any beginners looking for a solid knife. This knives 8-inch blade makes it very versatile. It can be used for everything from mincing to carving off of a bine. It has a stainless steel blade and rosewood handle. It is priced excellent and is a great all around knife. If you are looking for a low priced, 10-inch knife, this is the way to go. It is always good to have a 10-inch knife for larger jobs, such as meat carving, to add to your toolkit. This is another great and cheap stainless steel 8-inch knife. It has a non-slip rubber handle which makes it great for jobs such as mincing and chopping. It can be compared to $120-200 knives due to its high quality. Another example of a great and economical 8 inch knife. This knife also has a lifetime warranty, so go ahead and use and abuse it, you’re safe. As you can see, there are so many factors that go into choosing the best chef knife. There are a few things to keep in mind when searching: the blade, the shape, and the grip. If you follow these 3 things, you will surely find the perfect chef’s knife for you. Oh wow what a great resource of information about knives. Those knives look awesome!